Feedback forms are an important accessory of information which is widely used in commercial and non-commercial endeavors. Feedback forms allow users to experience their opinion regarding a product, task, facility etc. Using the information which is present in the forms, the makers analyze and implement the different aspects of feedback received for improvement and enhancement purposes. Below we share with you common types of Feedback Forms which are available in abundance across the Web. When a customer purchases a product from a shop, outlet or brand, the owners/makers make it a point to reach out to their customers to know their feelings towards their products and services. A feedback form could be a simple survey form with multiple-choice questions or direct questions below which recipients are supposed to give their views. In many companies, training sessions are held at regular intervals for new and existing employees. After the training session or program concludes, the organizers distribute a Training Feedback Forms in which the trainees need to give their response about the training session and also freely give suggestions and critiques if asked for. 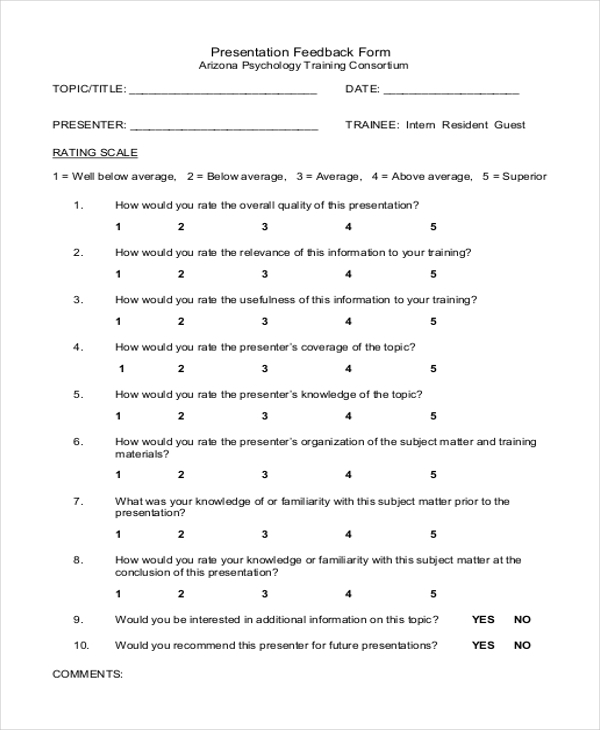 After a presentation session comes to a close, the audience is handed out a Presentation Feedback Forms in which they are required to rate the presentation and presenter on the basis of various parameters. Presentation feedback forms are valuable as they help the people responsible for knowing about the areas of improvement. Be it performance review or employee appraisal, employee feedback forms are a must-use document in almost all corporate setups. These forms are used by HR departments and managers to learn/find out how satisfied employees and is they’re happy or not. Such evaluation is also done for employee retention purposes. 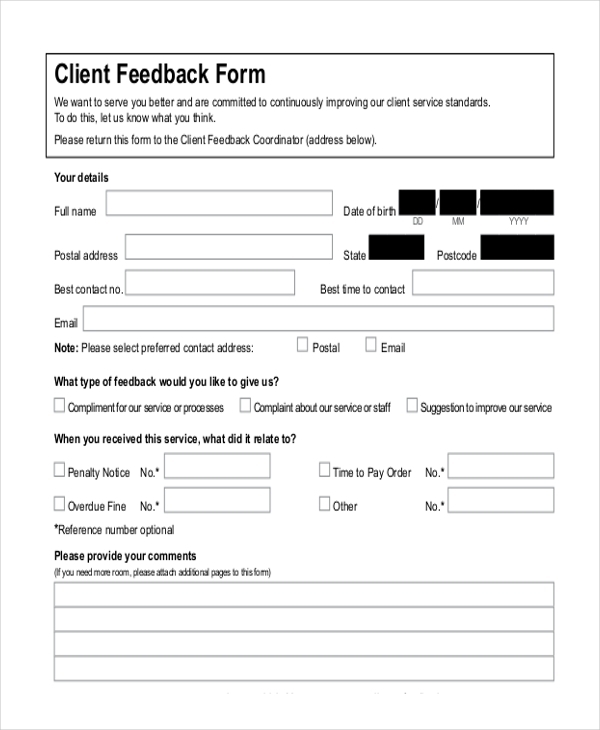 A client feedback form is useful for clients who want to deliver an evaluation of services and products which they may have received or purchased from an organization. Clientele feedback is significant and valuable about this kind of forms that helps business to improve themselves to suit the need and nature of their clients. 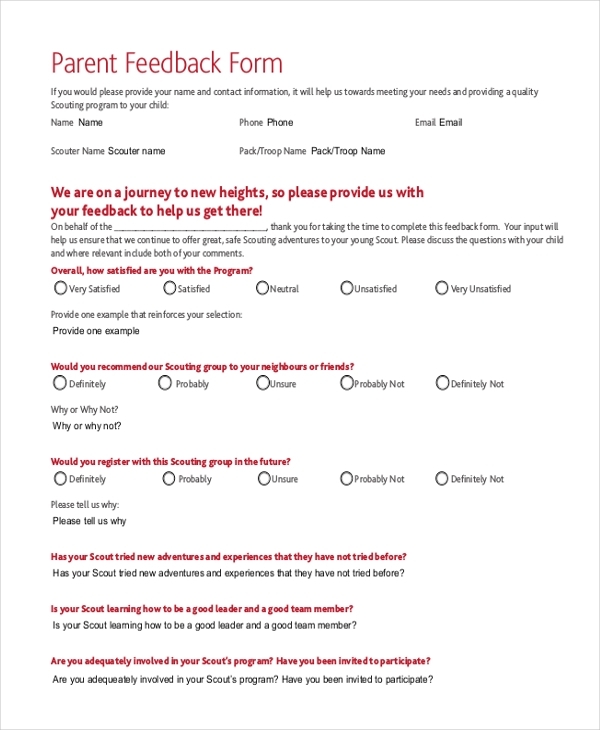 A parent feedback form is used by educational facilities like kindergarten, schools, colleges, day care etc. to survey parents and knows more about the parent’s expectations from the facility and what steps can be taken to ensure that the services can be improved to match their needs and their wards. 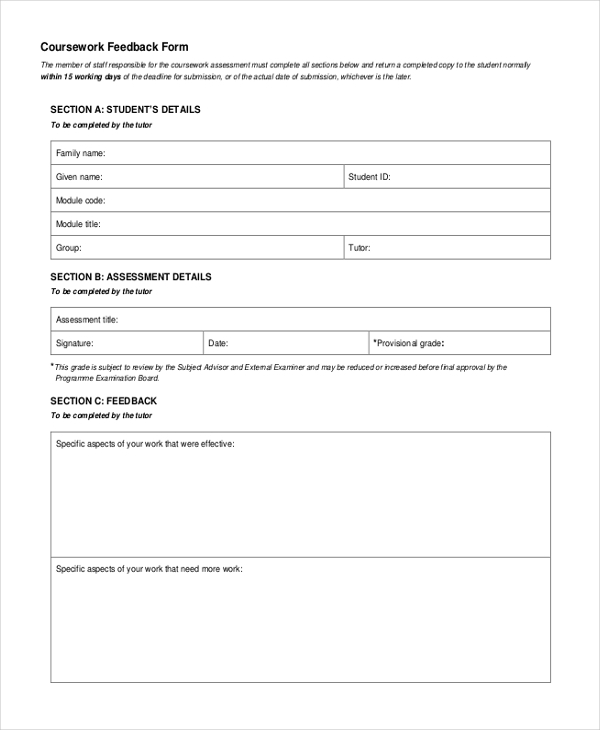 After completing a course in college or school, it is routine that authorities hand out a coursework feedback form. In this document the course applicant is supposed to give his views about the coursework – point out the pros and cons as well as give suggestions as to how the coursework could be improved for future batches. Access to products and services also calls for feedback from customers. 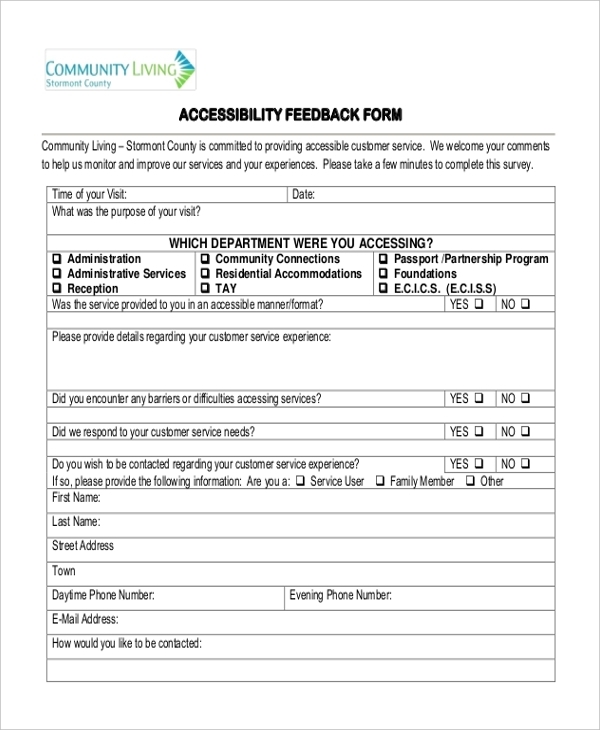 Regardless of which industry the business may belong to, accessibility feedback forms are a must-do and must-give for businesses world over. To surmise, these forms are used by customers/clients to give their feedback as to how easy or difficult it was to access a company’s products and services. Post-event feedback forms are very popular. 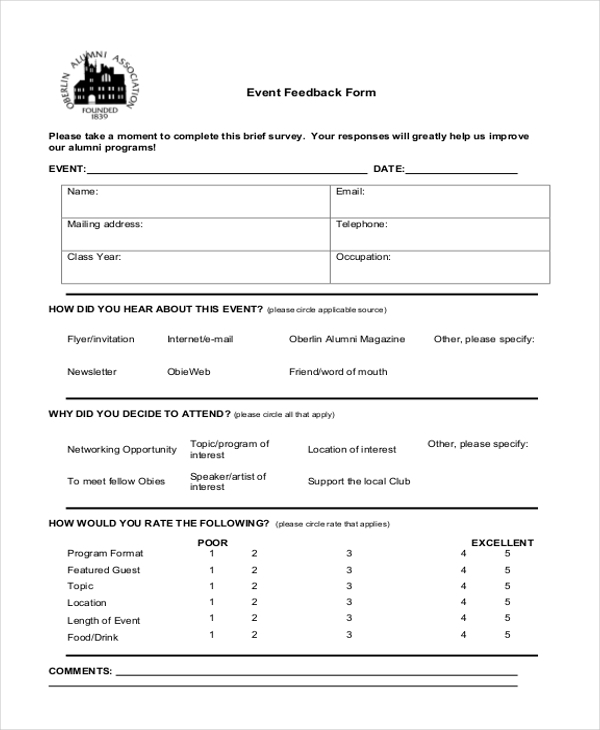 Event organizers unfailingly ensure that feedback forms are distributed to the guests. The Event Feedback Forms usually contains questions regarding the various aspects of the event, what guests like and what they did not. Also, specify suggestions and write complaints/grievances (if any). 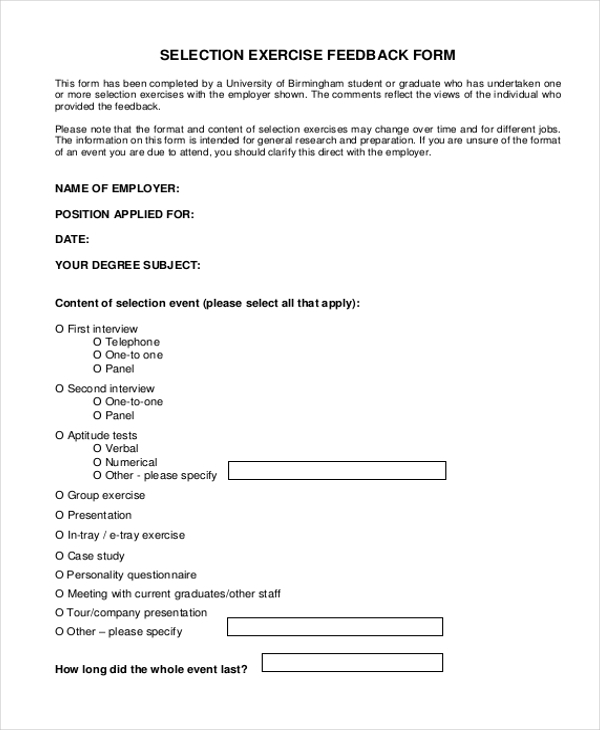 A selection exercise feedback form is used in scenarios wherein feedback is sought after a particular exercise or task has been completed successfully. The users of such a form need to evaluate and give their opinion for different aspects of certain exercise. 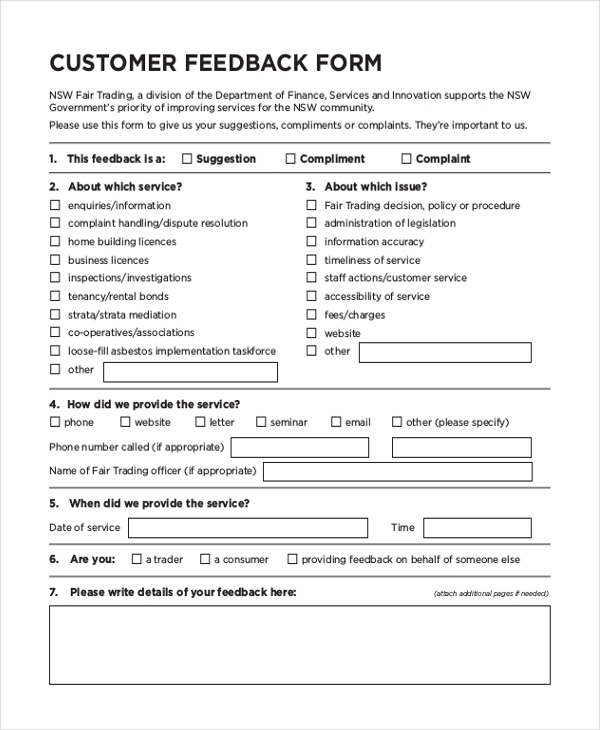 Be it to write suggestions or express complaints, feedback forms are an important tool for both. Corporate, academic, social and other kinds of outlets and businesses freely use feedback forms to gather information and gauge public’s mood and opinion regarding what they are offering or are to offer. One cannot undermine the value or use of feedback forms because they are an important tool for an opinion. You may also see Peer Feedback Forms. Where To Download Feedback Forms From? The Internet has websites in abundance which offer readymade, printable, download, customizable feedback forms for free. Well, of course, there are some websites we do charge a premium, but largely most feedback form examples are available for free, They can be downloaded in any of the following formats – Word, Excel, PDF, and PSD. The examples are high on quality and can be easily tweaked to match user needs and preferences. You can also see Employee Feedback Forms. If you’re a user and you’re looking for different kinds of feedback forms, we’re in certain that aforementioned content has helped you in a significant manner to know and learn what is there to know on the topic.